I am reminding myself that I do this (spinning) because I like it. It’s fun and relaxing, at least most of the time. Why do I have to remind myself of this? Because right now, I’m a little frustrated. I finished the sock yarn last weekend. I’m happy with the way it came out, and I learned some valuable lessons about spinning self-striping yarn. In particular, to create yarn with clean stripes and minimal barber-pole striping, it’s better to use Navajo plying than to try to come up with three singles that are even close to matching. Navajo plying creates a three-ply yarn from 1 singles, so there’s minimal overlap when the color changes. I didn’t do that. So I have lots of barber-poling, but I think it will be pretty when knitted up because the colors go well together. The next project I’ve embarked on is sort of a continuation of one from last summer. 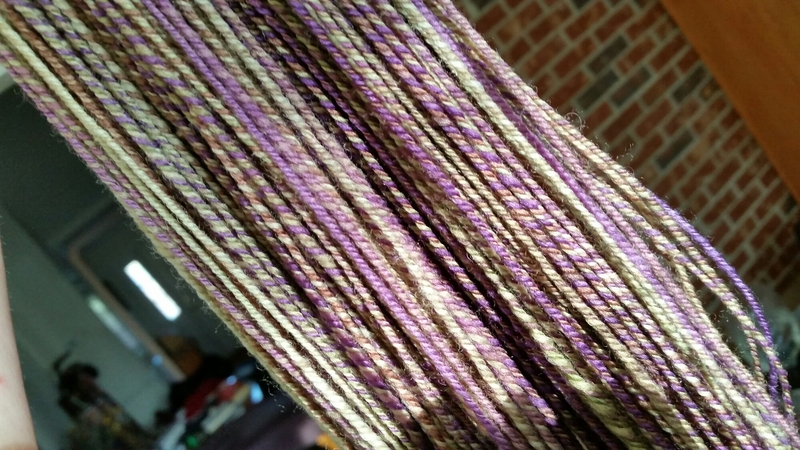 If you’ve been reading my blog regularly, you might remember that I spun a pound of merino-silk blend that had lots of beautiful colors in it. It was a good practice at spinning a large quantity of fiber at a consistent diameter. At SAFF this year, I bought another pound of the same fiber, same colors. I love the way the first yarn came out, and if I spin this one the same diameter, I should have enough to knit a sweater. It has such a lovely feel. So that’s what I’m spinning now. I have my sample to compare to from last time, for consistent diameter. I thought it would be easy – after all, I’ve done this before, right? Surprise! For whatever reason, I’m having a really hard time staying consistent and correct. The blend is slippery in a different way than the superwash sock fiber I just spun, and I’m spinning a lot thicker with it for this project. I’m just having to go slow and give myself time to “get it”. It’s a very fine line between too thick and too thin, and while too thick can be fixed, it requires care. Too thin has to be either accepted or tossed. The drafting has to be JUST right. So I keep on, and remind myself that nobody dies if I make mistakes. It’s FUN. I LIKE it. This is PLAY. This entry was posted in Art, Fiber and tagged Merino-silk Blend, Spinning. Bookmark the permalink.